A faster site means more money. When you have big images and run ads and have resource intensive plugins, you need to squeeze out every performance edge you can to compete with a saturated niche market. 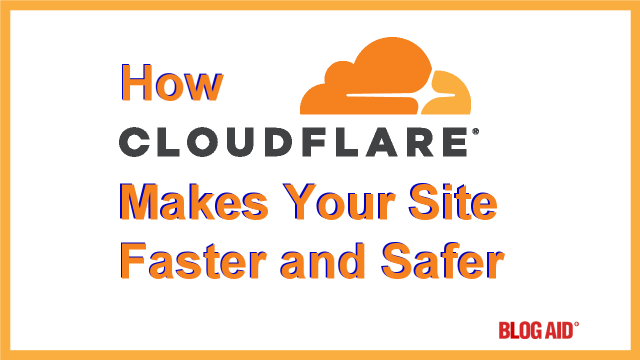 Adding the free CloudFlare service can cut your page load time in half and protect your site from bad bots. That means more traffic on smaller hosting. And that means more money in your pocket. See how easy it is to get the CloudFlare benefits on your site. The main service of CloudFlare is as a CDN, or Content Delivery Network. It mirrors your site all over the world so that it can be delivered from a location nearer to your site visitors than where your site files are located at your host provider. Think of it like ordering a pizza. If you’re in Dallas, are you going to order a pizza from New York? You’re going to order it from the best pizza joint nearest to you. That’s what CloudFlare does for your site. It delivers the files from down the street instead of across the country. CloudFlare has minification settings available too. Did you see that Harry Potter movie where Hermione kept pulling huge things out of her little bag? Minification of your site’s js, css, and html files is much the same thing. CloudFlare squishes all those files down into a little bitty package that can travel like lightning to your visitor’s browser, where everything is exploded to full size again. When your visitors click to see another post, a lot of those pieces don’t change. So, there’s no need to request all those files anew. Those files are flagged to cache. CloudFlare does a super duper job of caching parts of your site that don’t change on each page load. And that speeds up site performance too. Your visitors see more and stay longer on your site. and more opportunities for you to earn money. CloudFlare is the only CDN that offers bad bot protection for free. That negatively impacts your bottom line in two important ways. First, it leaves fewer resources for your real, human traffic. That makes the site slower for them, which may cause higher abandonment rate. Fewer folks actually seeing your posts means fewer sales. Second, you’re renting your hosting resources. I hear this from site audit clients every day – how their host suggested they upgrade their package due to site overages. Those bad bots are opening pages for just a second or two. All this takes CPU, memory, bandwidth, and I/O usage for nothing more than a bad bot to hit just one page/post on your site! Stop the bots! CloudFlare blocks bad bots before they ever hit your site. Listen to site audit client Leila Martin tell how properly securing her site saved her $2400/yr in hosting. Go Through Host or Get My Own Account? Lots of hosts partner with CloudFlare so that you can add CloudFlare via your cPanel and not have to point your DNS (domain) to CloudFlare. I would strongly suggest that you get your own CloudFlare account. First, if anything ever happens so that you lose access to your host, you can’t disable or make changes to CloudFlare. That means you’ll have a tough time moving to a new host in an emergency. And that happens more than you know!!!! Second, you want to have full control over the CloudFlare settings. Some hosts have a setup where part of the settings are on the host and part of them are on CloudFlare. And some of them are not available at all. If you are already set up on CloudFlare via your host, have them disconnect it. And then get your own, free account. As more sites convert to SSL (https), the use of CloudFlare has to be taken into consideration. CloudFlare does offer both free and paid SSL certificates. I can’t use the free version of CloudFlare if I don’t use their paid SSL certificate. It’s not a hack. It’s a setting in the Crypto section, along with many other nice HTTPS related settings – including one that will help your site get listed on Chrome’s safe preload list. In October 2016, half the internet in the U.S. went down due to an attack on the Dyn DNS service. Once you switch to CloudFlare, it will become your new DNS handler. It has multiple distribution arrays, which means that your DNS can be handled from any of several locations. If one comes under attack, there are plenty more safe nodes available. Having a free CloudFlare account improves your site in so many ways that it’s crazy not to make use of it. A faster, safer site is what it’s all about. I’ll help you set up CloudFlare for max benefit and point your DNS in a live session. Then I’ll create the 3 page rules so your admin pages won’t be cached. And then integrate it with your local caching plugin too. The best part is, you’ll know how to purge the cache, pause it, or put CloudFlare in development mode for troubleshooting or design changes. And, if they add new features, you’ll be able to do them yourself. Whole thing takes all of 30 minutes and done. Request your session now.